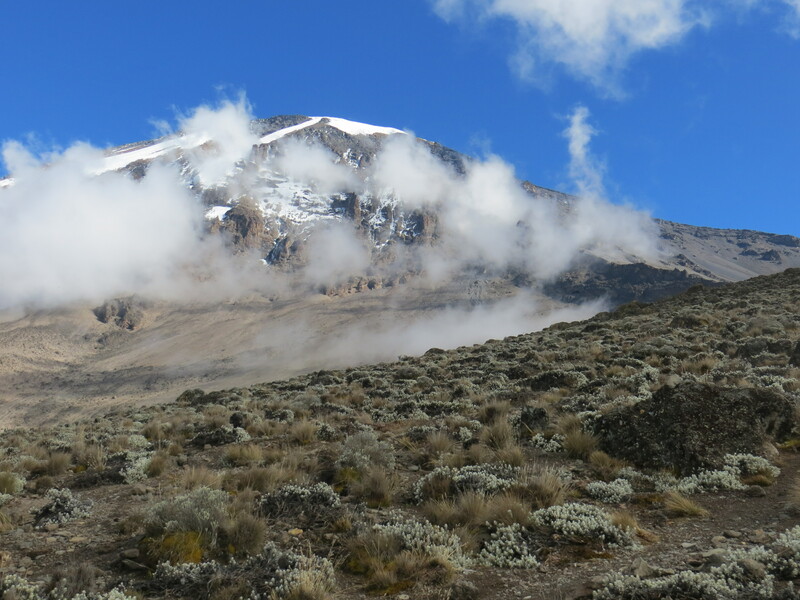 And away we go… day 1 of my Kilimanjaro climb (after being dropped off by bus at the gate) began at the Machame Gate (altitude: 1,640 meters/5,380 feet). 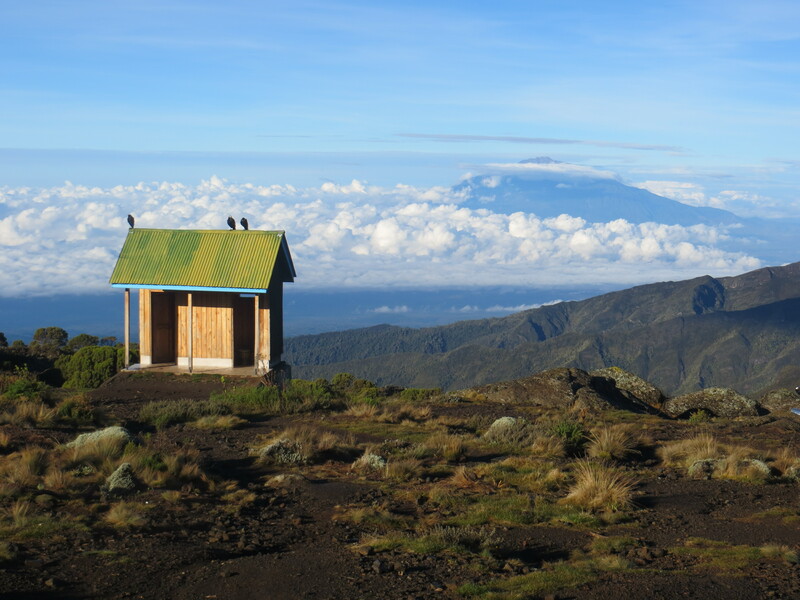 The schedule and route called for about a 4-hour (or thereabouts) hike over 11 kilometers to Machame Camp (altitude: 2,850 meters/9,850 feet). Lauren (my friend), Joseph (our guide) and I started down in the rain forest that covers the bottom of the mountain… day 1 was to take us right up to the very edge of the rain forest where the camp was situated. The climb was actually pretty gentle, and Joseph let Lauren and I walk at out own pace. On the way up I ended up passing many of the porters (both our group’s porters and those of other groups)… note that this was actually the only time that would happen. As an aside, with a trekking company and a trek like this one, all you really walk/climb with is a small backpack with some water, some snacks and maybe some extra clothes, as most of your stuff gets carried by a porter… so I used my spectacular (you may may remember this backpack from such moments as the Camino De Santiago and climbing Mt. Sinai) orange backpack. After about 4ish hours of easy hiking, we all arrived at our first camp… where our entourage had already set up our little village (one tent each for Lauren and I, one tent for the guide and the assistant guide, a mess tent for Lauren and I to eat in, and a cooking tent for… wait for it… cooking (the porters slept in the mess and cooking tents at night). Foreshadowing things to come, the already dakened sky opened up and it started to rain about 30 minutes before we reached camp… and continued to rain until just after the sun went down (luckily, as Joseph had assured me the day before we left, the tents were high quality, or at least of medium quality, as no rain or ground seepage got in those suckers… and it rained pretty hard that first day as a good test). Lauren and I were shown our tents, provided with a small basin of warm water to wash up and informed that tea and popcorn would be served in the mess tent in about 15 minutes… so we cleaned up and changed clothes (after several months where I had to bucket shower with seemingly occasional regularity I was quite used to this… and you’d be surprised at how clean you can get with just a little bit of warm water and soap), all the while hoping the weather might clear to dry some of our now wet clothes. We then headed to tea time in the mess tent (I’m not really a tea drinker, but the instant coffee provided was so bad that I stuck to tea for the entire trip). All the while it continued to pour outside… we headed back to our tents to chillax while we waited for dinner to be cooked and served (around 6:30 PM every night). When the proper time rolled around, we headed back to the mess tent to try out our cook… and it turns out he was pretty damn good (even better than the guy we had in Ethiopia… later in the climb, after chatting with him for a couple of days, I found out he liked to think of himself as a “stomach engineer”). The meals started with some hot soup (lentil, carrot, leek, potato and banana were the ones I recall off the top of my head… and the bananas were local plantains, so they tasted different from you and I think of as bananas…more like potatoes than anything else), then there would be a main course (generally some rice or pasta and some kind of meat), and then fruit and tea for dessert. All very good, the hot soup and hot water (for the tea) being very welcome given the relative cold and dampness going on around us. I have to hand it to our cook…he was good… really good… especially considering he was cooking over one gas burner (the gas canisters were carried up by porters… at least they got lighter day by day, as did the food stores). As another aside, I found the logistics involved pretty fascinating as there was some pretty smart coordination throughout the climb… given that certain foods spoil rather quickly (meat for instance), there was a constant shuffling of porters going back down the hill to meet food delivery folks coming up from the nearby towns with fresh food… all coordinated by cell phone (this being Africa, cell phone reception is perfect everywhere… yes, cell phone reception is much, much better here than in the US). There’s a logistics / supply chain engineering case study in the making here… it was all actually very impressive given all the variables (we only had one late delivery, near the very top of the mountain, where we had to wait a whole extra hour for dinner). Anyhow, after dinner, Joseph comes in and explains the climbing and the schedule for tomorrow, then Lauren and I talk for a bit and then head back to our tents… no mingling with the other climbers as it was still raining pretty hard. The rain at least let up by around 8 PM or so, but this being climbing and tent campaign and all, everyone goes to bed pretty early (“lala selama” being sleep well in Swahili). A view up to the peak on one of the trails higher up the mountain. The next day we are woken up by our “waiter” at around 6:30 AM with tea and a wash basin of warm water to clean up again, and are informed that breakfast is going to be served in fifteen minutes in the mess tent. Overnight the weather has turned in our favor… as it’s nice and sunny and clear (although a bit brisk) in the morning. We head over and get another very good meal (breakfast proved to be a first course of porridge followed by some variation of eggs – scrambled, fried, omelet – and carbohydrates – toast, crepe, pancake – combination with sliced fruit). During breakfast we hand over our used water bottles that will be returned before we leave with boiled water (the water for the climb is taken from the many mountain springs on the mountain and boiled by the cook… I never had any stomach issues with the water or the food, but Lauren did). As this was to be just a morning hike, no boxed lunches were given as we’d be served a hot lunch upon arrival at the next camp. After breakfast, I headed back to my tent to change into my hiking clothes and to pack my stuff for the porters. By about 8 PM we (and by we I mean Lauren, myself and our guides) were all ready to go and took off. Bathroom in the sky… with Mt. Meru in the distance. 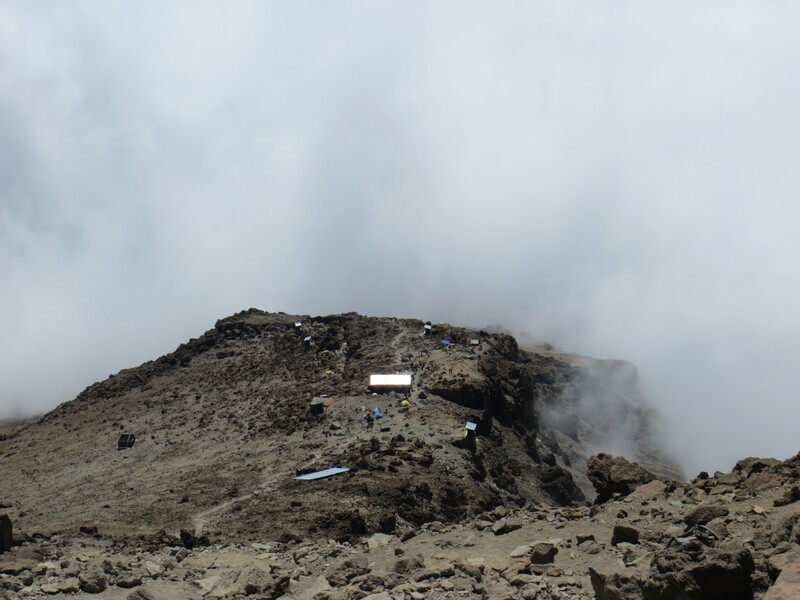 Day 2 of our route went about 5 kilometers, from Machame Camp (altitude: 2,850 meters/9,950 feet) to Shira 2 Camp (altitude 3,810 meters/12,500 feet). 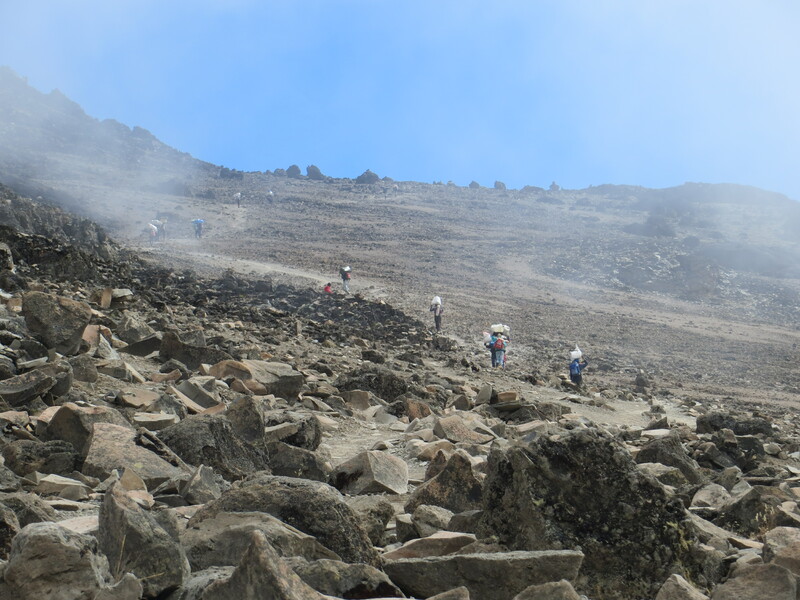 The climb was expected to take about 3.5 hours and was supposed to be steep… and oh man… were they right. Day 2 is where I learned “pole, pole” (pronounced polay, polay), which is Swahili for slowly, slowly. We started off at a a pace that I would describe as excruciatingly slow… I’m talking old people walking pace… pole pole, very pole pole even. However, it soon became apparent why… the trail for day two was pretty much stone steps and rock faces that went more or less straight up (just because there’s no technical climbing skills required does not mean that we didn’t have to use our hands as well as our feet to climb certain places along the trail). The guides make you go slowly for two reasons, the first being that they don’t want their clients to get altitude sickness… so they go real slowly to avoid over exertion and stop to make you drink copious amounts of water (which is the best prevention of all for altitude sickness). 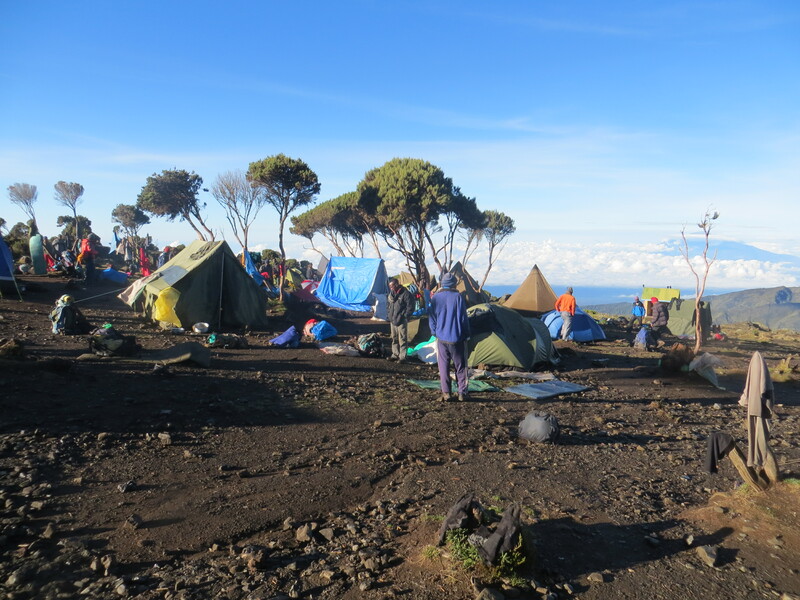 The second reason is that they want the porters, who break down camp after we leave, to have enough time to pass us and to set up camp prior to our arrival. And actually, this is where I can note that the porters are very, very impressive… they basically run up the trails… with 20 kilos (45 pounds) generally balanced on their head or necks… and are very mountain goat like even on the steepest of trails… they are generally pouring sweat the whole time, but they generally don’t get too tired and they rarely stop for even a water break. Just insane. The trail on Day 2 took us from the edge of the rain forest straight up to a very moorland-like plane of vegetation… very few small trees with a lot of bushes and grasses. Right on schedule, of course, about 30 minutes before we arrived at camp it started to rain. Which, if it was going to rain, was at least nice enough to wait for us to get off the really steep part of the trail (this part of the year, November and December, features what the locals like to call the “short rainy season”… so it generally rains every day, but only in the afternoons… the mornings and evenings were clear… a pattern that held true throughout the climb). Lauren and I arrived at camp to find our tents set up and hot water in a basin for cleaning up. 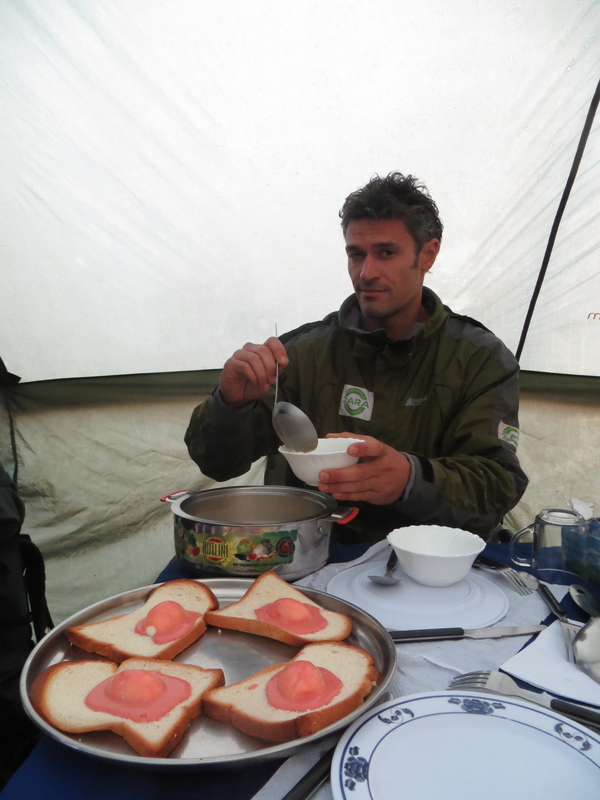 A hot lunch was served in camp as well as tea and popcorn in the afternoon. Again, not a lot of socializing as it was raining pretty hard outside. The rain cleared around dinnertime (the dinner, again, was delicious) so we got to stretch our legs a little bit and were able to see more than 50 feet away from our tents for the first time, which was nice. Arriving at camp on day 2 in the fog and rain. More of the same on day 3… early wake up call with some hot tea and a basin of hot water for washing… clear all around. 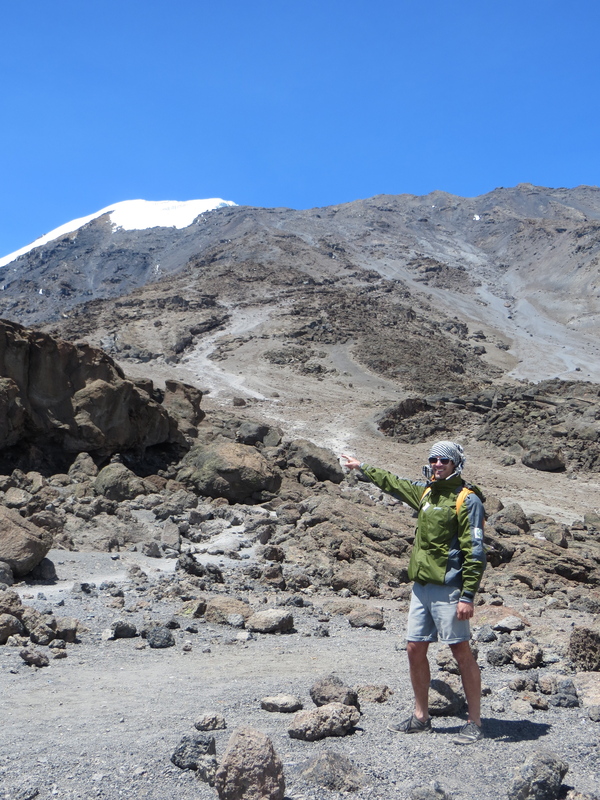 Day 3 was a bit harder, calling for a 4-hour climb up to lava tower (altitude 4,630 meters/15,190 feet), where we’d eat lunch, then descend for 2 hours to barranco camp (altitude 3,975 meters/13,045 feet). As we ascended, the vegetation got even sparser, to the point where there was barely any plants at all around the lava tower area. Boxed lunches were provided to eat at the high point of the climb, and it’s here where we ran into the four other Americans (as described in part one) that our guides tried to keep us separated from. Again, right on schedule, about 30 minutes before we reached camp on the decent (can you guess what happened by now), it started to rain. So, despite what must be have been fabulous views, we really never saw much more than giant fog banks (a phenomenon that, living for a decade in San Francisco, I was accustomed to). Everything I’d read before the climb about the weather during the short rainy season was pretty much spot on… we’d have the beautifully clear mornings and evenings, where we could see all the way down to Moshi (the town at the foot of the mountain) and up to the summit, but then around 10 AM or so a the fog would begin rolling in, and then it would start to rain sometime in the afternoon (again, almost always 30 minutes before we reached camp… no matter how far we were going that day) straight on through to the early evening, where it would clear up again as if it hadn’t rained at all. Although it wasn’t the biggest of problems, everything was always a bit damp as nothing really got enough time in the sun to dry properly… especially things like socks, shoes and towels… which made for a bit of extra fun at night when things got pretty chilly (and although we had waterproof jackets and pants, when you’re climbing, even when it’s cold, you still sweat a bit, so it always seemed like things were just a touch on the damp side pretty much the entire climb). On the trail… Day 5. Days 4 and 5 were the relatively short hiking days… some steep ascents, but these were always rather short compared to the climb up to the lava tower on day 3. Lots of relaxing time in the camps, with day 5 producing the lovely timing of having no more rain (because by the time we reached the day 5 camp, we were literally above the clouds, and therefore outside the possibility of having any rain). 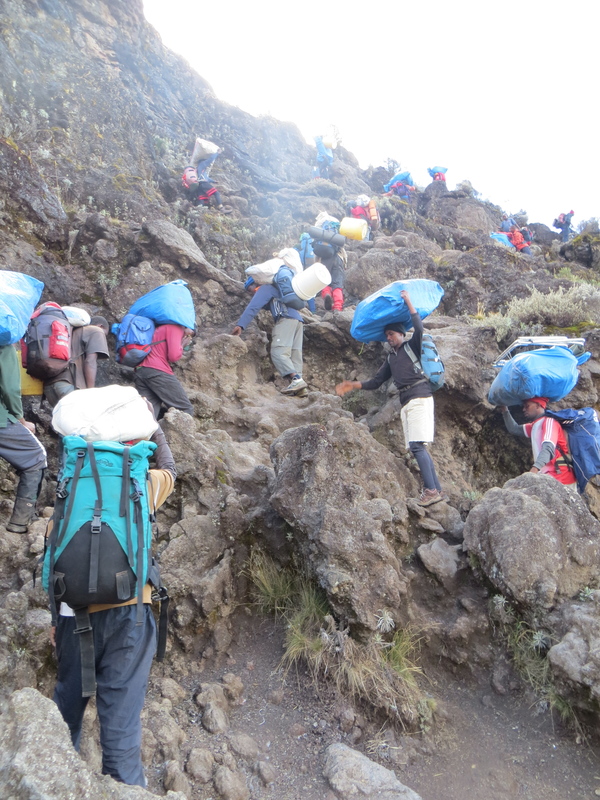 On day 5 we reached barafu camp… and barafu means ice in swahili… so you can imagine the fun we were in for. Barafu camp is located on a relatively sharp, small and steep ridge at 4,675 meters (15,330 feet)… leaving it rather exposed to the elements… and elements in this case referred to a brutally cold, and strong, wind that blew pretty much from about 2 PM on (there was actually a lovely window of opportunity, from about 1 PM to 2 PM, before the wind really picked up, to actually be warm, hot even, in our tents, since by this point we were above the clouds and in the mid-day sun… it was the first time we’d been warm on the climb the entire trip since we left our hotel). Just prior to lunch our guide made us climb about an hour or so up the cliffs behind the camp… for the ostensible purpose of further acclimatization (we went up to about 4,850 meters, or 15,900 feet) and to get a feel for the the cliff since we would be tackling it in the dark. We made it down before lunch, ate, and settled in to try and get some rest since we were going to be up at 11 PM that night to begin the ascent toward the summit (yes, you read that right… 11 PM wake up call). 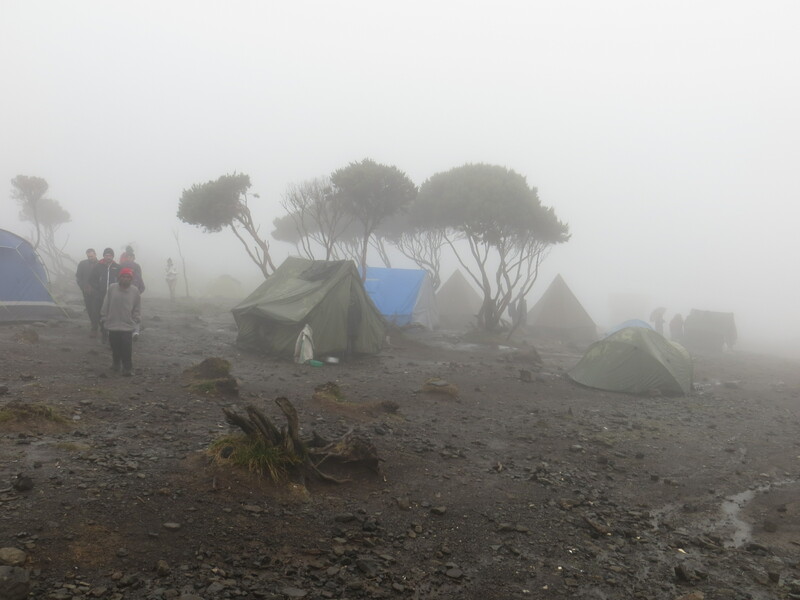 Barafu Camp… view from above looking down at the ridge where the camp is located… the fog is hiding some pretty steep drop offs. Another wow, you are amazing.